Things are going a little more slowly than expected for the St. Paul Classic Cookie Company, but you’ll get a chance to sample their wares this weekend. Last we heard the shop at 779 Smith was expected to open sometime this summer. But summer’s over, and there are few signs of progress inside the little storefront that used to be home to the coffin shop. 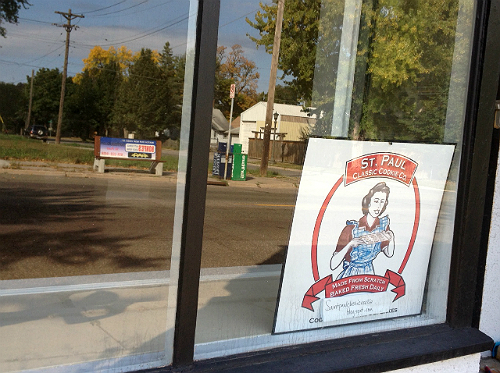 Fret not, says proprietor and baker Katie Novotny. The shop should open sometime in the next few months. Kitchen plans are underway, and once the requisite permits and inspections are complete, Novotny will be in business. “We’ve got to be open for the holidays,” she said. If you can’t wait that long, Novotny will be holding a bake sale the next two Saturdays (October 5 & 12) at the West Side Farmers Market at George and Stryker (in the parking lot of the Icy Cup, aka the old Dairy Queen). There will be cookies and scones available, and Katie is taking requests via email. The market runs from 9 to noon, rain or shine. Be sure to stop by and support this new neighborhood business!